I am blessed to have married into a very musical family, and my lovely wife, Dawn, happens to be a wonderful singer. With that, I would like to invite you to check out her debut CD, Because I Love You. This collection features her interpretations of such all-time favorites as "Pennies from Heaven" and Gershwin's "Our Love Is Here to Stay" (where she is joined by yours truly), in addition to refreshing renditions of Norah Jones' hit "Come Away with Me" and Al Green's "Let's Stay Together." 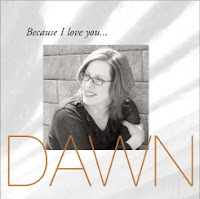 Dawn also demonstrates her song-writing talent on the album's title track. One of the reasons I mention this is that everyone appreciates great music (and since you're reading this blog, you obviously have pretty good taste), so I know you will enjoy this CD immensely. The other reason is that Dawn and I are in the process of adopting a little girl from China, and all proceeds from CD sales will go to fund that adoption. So, if you'd like to help out a good cause, if you're looking for a perfect Valentine's Day gift, or if you just like good music, check out Because I Love You. Click here for ordering information.